Use this tool to get notified by email or text of schedule updates (typically within 2 weeks), game results, events or news articles. Once you type in your email or phone number you have the choice of which team to subscribe to and which options you would like to choose. This tool is located on the Organization homepage on the bottom left side. Make sure to include the Organization News Articles to get updates on rain outs, photo night, year end BBQ, player development opportunities and other AMSA news. You can include Player Development to get updates on skill development sessions such as pitching/catching clinics, hitting instruction and Winter Ball. You can subscribe to your team(s) schedules and have them automatically sync with your other calendars when those schedules change. 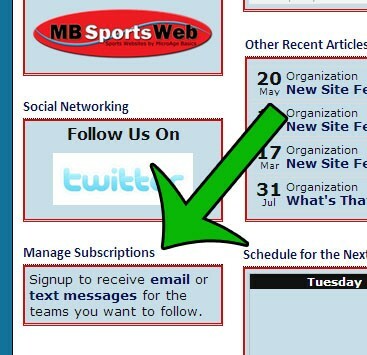 Just navigate to your teams calendar and then click the "Subscribe" button and read the instructions. You can also subscribe to the Player Development calendar to include dates for pitching/catching clinics, hitting instruction, Winter Ball etc.